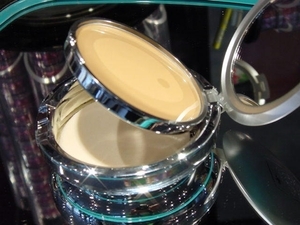 Total coverage Natural	Beige cream-to-powder foundation instantly camouflages uneven skin tone	and imperfections but leaves a silky, creamy finish. Comes in two-part compact with application sponge in vented bottom compartment. For the silkiest finish ever for dry skin, wet sponge first with Elastin Collagen lotion and run into foundation and apply to skin.